Friday nights at the Nampa Eagles will be starting Friday, September 12th. Jennifer will be teaching an Intermediate West Coast Swing class prior to a DJ'ed West Coast Swing dance from 8:00 -11:00 pm. The following two weeks, Jennifer will teach Country Two Step followed by dance music by Straightaway (DJ music on the breaks). SWIdaho Dance Presents another set of Dance Workshops to the Treasure Valley, May 9-11, with Craig Johnson and Joan Lundahl. Craig and Joan began competing on the West Coast Swing and Country Dance circuits in 1996 and won numerous local, state and international competitions before becoming dance partners in 2004. Their successes in the professional Crown Division include twelve Crown Championshipwins, seven UCWDC World Championship Titles and Worlds 2012 Points Champions! Craig has also won the prestigious “Top Teacher” award at the Frezno Dance Classic and the South Bay Dance Fling. Each lesson will be 1 hour with 1/2 hour practice and review with instructors’ assistance. Bring your camera. You will be able to video the lesson recap. Visit www.swidahodance.com to register or for more information. Schedule a private lesson with Craig and Joan for Friday or Sunday. $75 per 50 minute lesson with 2 instructors! Call Jennifer (208-860-2132) or email at swidahodance@gmail.com to schedule your appointment.Type your new text here. Jeremy Bryan will be in town May 17-19 to teach private lessons. If you are interested in taking a lesson while he is here, please contact Jennifer for availability and pricing. 208-860-2132 or lessonsindance@gmail.com He will also be teaching West Coast Swing on Saturday night, May 17th, at the monthly High Desert Swing Dance Club dance. Want to enjoy a great night out social dancing with two of your instructors? 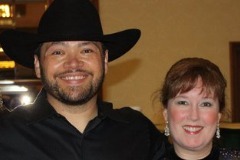 Thomas and Jennifer will be at the Eagles in Nampa this Friday night, March 15th, to dance to the band Straightaway. This is a great opportunity to have some fun and meet some new people!! What a wonderful weekend we had with Jeremy Bryan this weekend in Boise!! He taught a great Country Two Step Workshop on Saturday afternoon, and was also able to teach 16-hours of private lessons to the valley. THanks Jeremy for all you do to help the dance community in Boise! !